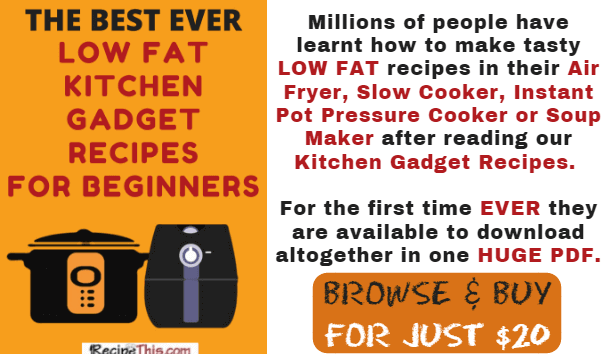 Featuring 100’s and 100’s of low fat (or fat free) kitchen gadget recipes for beginners. If you follow a low fat or fat free diet then these low fat recipes are PERFECT for you. We’re the Milners. I am Samantha and along with my husband Dominic we started RecipeThis.com in the November of 2015. We are huge fans of kitchen gadgets and the first one we had in our home was a slow cooker that a sweet pensioner gave us in 2004. We loved how SIMPLE it was to cook in the slow cooker and how much less fat we needed to use. After that we were hooked. The Air Fryer joined our family in 2011, the soup maker in 2014, this was followed by the Instant Pot Pressure Cooker in 2016. Since then we have reduced our processed foods by more than 95% and eat a LOT healthier and I am no longer OBESE. After all, because kitchen gadgets are so useful, it takes us as long to prep a delicious meal in a kitchen gadget, then it does to cook a ready meal in the microwave or get a takeaway. I credit the kitchen gadgets that I own for allowing my appearance to change so much from one Christmas to the next Christmas. As well as this we have been previous members of many diet clubs, followed the 5:2 diet and replaced meals with horrible tasting shakes. We don’t follow any of them now and just prefer to cook from our kitchen gadgets instead. But because kitchen gadgets are very similar style of cooking to these diets, we have found we have a growing fanbase that are looking for diet kitchen gadget recipes. Well that’s what is the case with our kitchen gadget recipes and on the request of several of our readers, we have put them together in ONE huge Ecookbook so that you can enjoy healthy kitchen gadget recipes whenever you like! Ignoring our love for chocolate chip cookies and focusing on recipes that are low in calories, hardly any fat and are also low in sugar. We have gone through every recipe we have cooked, checked the ingredients list and put together a huge selection of low fat recipes. Whether you go to a diet club or just want to eat healthy at home and lose weight along the way, then this is JUST FOR YOU! I say low fat because most of our kitchen gadget recipes involves NO FAT or just a teaspoon per person. Imagine having all your favourite fast food, Indian Food, Chinese Food, Italian Food and even Grandma’s comfort food and still losing weight at the same time. Do You Like Takeaways & Fast Food? We certainly do. I am sure I could put the kebab shop as the excuse for why I ended up weighing in at 15 stone in 2007. I would claim that I was too tired to cook, Dominic would claim the same and then we were so lazy back then, that we would argue over who would be ringing for a takeaway. My favourite was a chicken doner kebab and I would have it with fries and onion rings. Dominic on the other hand, adored a burger and would often order a double cheeseburger and a single chicken burger. Plus, he couldn’t possibly have it without fries. There would often be a special deal too so we would end up with garlic bread on top of everything else. We would have one of these takeaway binges about 4-5 times a week and no wonder we were obese. Shockingly neither of us ever suffered from cholesterol problems or diabetes. But I need burgers, fries, pizzas and kebabs in my life. But rather than eating like a fat person, I make them now using my kitchen gadgets instead. In our low fat cookbook you will be spoilt for choice. 100’s of recipes exclusively created by Dominic & Samantha Milner here at recipethis.com – we don’t steal Recipes off the internet like so many other people do. We tried counting them all for you but there are so many we lost count! Low Fat kitchen gadget recipes focused around the air fryer, pressure cooker, slow cooker, and soup maker. A bonus section of non-kitchen gadget recipes with even more exciting recipes. Slow Cooker highlights include our chicken casserole with real mash, Chinese chicken and we adore our Big Mac stuffed peppers. If you love butternut squash but hate peeling it then cook a whole one in the slow cooker. Or for the curry lover, we have a 3 ingredient keema curry. Air Fryer highlights include our Greek chicken, Nandos recipe collection and our big fat juicy burgers. Or if you love fries then you will have the dilemma of choosing which fries recipe to make first! Soup Maker highlights include our broccoli cheese soup, cauliflower cheese soup and our curried butternut squash soup. If you’re in a rush to lose weight then try our speed soup. If you hate eating vegetables, then our eat your greens soup is a winner! Instant Pot highlights include a range of vegetables that cook quickly and effortlessly in the pressure cooker. Plus, as they are steamed and not boiled keep their real taste. As well as this we have stews, casseroles and soups. Plus, the best ever roast beef you’ve ever tried. Then serve it up with a side of my diet friendly cauliflower cheese. The Bonus Section highlights include a fat free cheese sauce that is totally flourless, yet totally addictive. Or why not fill yourself up on our homemade hummus? Or you could get excited over trying our 2 different takes on lasagne. Just a much lower calorie version. At this time our Best Ever Low Fat Kitchen Gadget Recipes Ecookbook is only available in ebook format. This is great for you because you can download the ebook to your computer, laptop, tablet, kindle or phone. Then print off a recipe as and when you need it. But even better it saves you waiting for a book to arrive and you can literally start reading our Best Ever Low Fat Kitchen Gadget Recipes Cookbook in a couple of minutes from now. It is also priced at JUST $20.00 (£16) for our Best Ever Low Fat Kitchen Gadget Recipes (+ bonuses) that is less than $0.10 per recipe. But it gets EVEN BETTER you can now pay $40 (approximately £32) and get upgrades for life. This means that when we add new low fat kitchen gadget recipes to the blog then you get an upgrade. We do this quarterly and the latest version includes up to 31st of October. Just in September and October we added 24 new recipes.